A very elegant multi color floral print, deep V shape neckline kaftan has simple style which makes it more feminine and classy. It has a tie up style on waistline. It has elegant and rich Indian embroidery work on its neckline. This kaftan carries a luxurious feminine look with it. •	Finished from fine Polyester fabric. 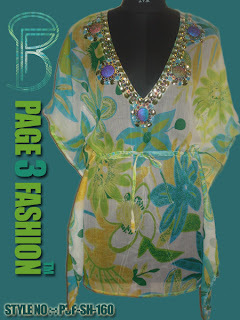 •	Gorgeous green and blue color floral print and embroidery. •	It has sense of luxury and comfort.